The score is 8/119, with THCC needing 14 runs to win. Kartar is bowling to Safi. The left-arm spinner has taken three important wickets, including Sandeep, Raman and Israfeel. The atmosphere is unbearably tense, and has been ever since THCC, chasing 132, had lost 4/2 to move from the comfortable position of 0/36 to 4/38. Despite some smart batting by Raman and Steve, runs are becoming increasingly harder to get and wickets continue to fall. Safi joined Aman at the crease with the score on 8/102. Kartar jogs into bowl. There’s silence on the field. Aman at the crease. Thanks to Bianca for the photo . THCC shouldn’t really have been chasing 132. Some great opening bowling by Israfeel and Bipin saw HICC plunge to 5/10. But some strong hitting by captain Sanjay (60), supported by Herry (23), saw HICC put up a defendable target. There was plenty in the wicket for the bowlers, and it was impressive how HICC fought back hard. 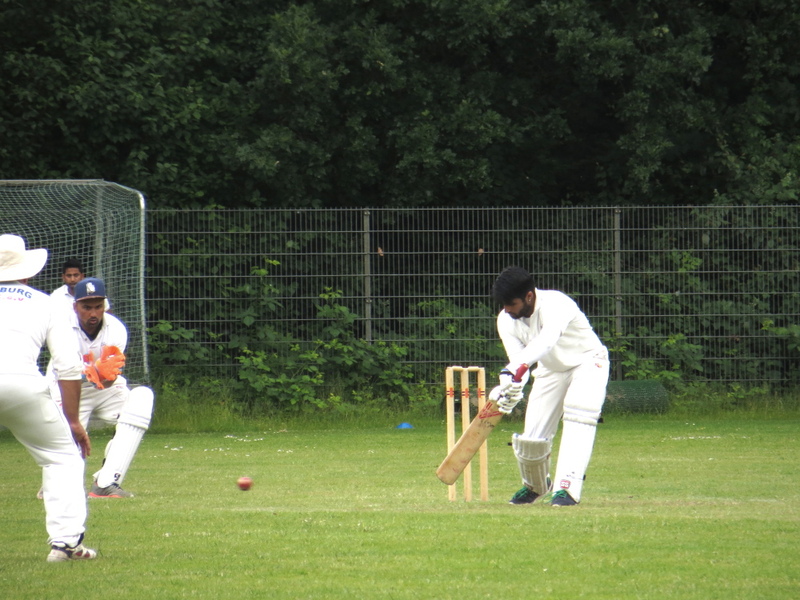 Sanjay bowled well and held two excellent catches, while Kartar was proving difficult to play. They were well-supported by good fielding by the HICC players. Kartar, wanting a wicket, gives the ball a bit more flight. Safi doesn’t quite get to the pitch of it, and the ball bounces up on the grass wicket. It hits the fall face of the bat and lobs in the direction of Kartar. At this point in match, there are quite a few spectators, including passersby who have picked up on the tense state of play and have stopped to watch. Each run has been wildly applauded, as the runs required are counted down. Aman is batting with smarts and flair, using his stand-and-deliver batting stance to hit some wonderful shots to the boundary. Safi is watchful, keeping his wicket and supporting Aman. It’s fantastic to see these two young players rising to the challenge of this tense moment in the match. Can they bat THCC to victory? Kartar has other ideas. He raises his hands to nab the simple catch Safi has lobbed to him. The wicket will bring in last man Bipin for what would surely be a seriously tense final wicket partnership. But Kartar, who has already taken one excellent caught-and-bowled, somehow bobbles the catch. The ball hits the ground. Safi survives. He prods at a few more balls from Kartar and gets through the over. At the other end, Aman continues to bat with smarts and flair, hitting a four and sneaking a single to retain the strike. In the following over, he hits Sanjay for two boundaries and THCC sneak home, winners by two wickets. And everyone breathes a sigh of relief. What a great game it was. And how impressive it was that HICC fought back so hard to push for an unlikely win. And how satisfying it was to see two of THCC’s young players batting the team to victory. Many thanks to Sanjay and the HICC players for a fantastic and exciting game of cricket. Big thanks to Tina and Dave for scoring once again (love the double Technicolor scoresheets).